There are not many people who can claim that their lives have been changed by an egg tart, but Chef Raymond Wong – who heads Macau’s Institute for Tourism Studies Educational Restaurant – says when he tasted Macau’s famous local Portuguese tarts there was no looking back. “I left Hong Kong when I was just nine years old,” says Raymond, who grew up in San Francisco and studied the culinary program at San Francisco City College. 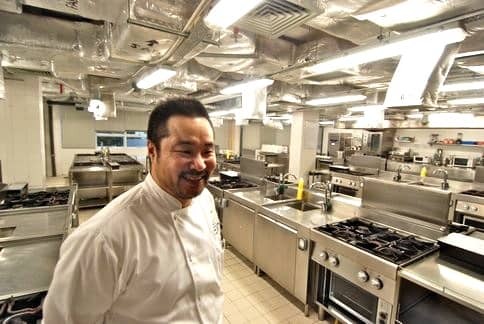 He said the unique taste of the tart was the beginning of his fascination with Macau’s world famous cuisine – a centuries-old fusion of Asian and Mediterranean cooking. “It’s just a typical egg tart, just like we have in Hong Kong, but what makes it so different is its caramelisation; it’s really sweet and fragrant. The crust is different, it’s made of puff pastry instead of sweet dough. “It really got me looking more deeply into Macanese cooking,” he said. More than any other region in Asia with a comparable colonial history – for instance the Spanish in the Philippines or the French in Vietnam – the Portuguese laid down a strong culinary imprint in Macau and the locals are justifiably proud of its history. There are often long queues at favourites such as Fernando’s and on some weekends it can be almost impossible to get a table. The restaurant does not take bookings and works strictly on a first-come, first-served basis. A Lorcha is another Macanese gem serving the territory’s famous African chicken, a Portuguese colonial dish that combines Goan and east African influences, grilling the chicken with chillies and spices. 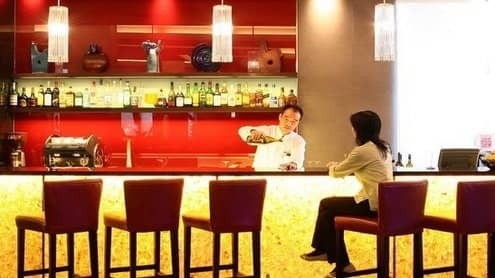 Local connoisseurs are also beating a path to Raymond’s IFT Educational Restaurant – just a few steps up the road from the Pousada de Mong-Ha – as his reputation for mining the local culinary culture grows. “It’s an endless field of fascination,” he says. He said this type of culinary archaeology – many of the recipes in Macau are more than 100 years old and are passed on by word of mouth alone – has many surprising quirks and often has a strange language of its own. “These recipes are kept within families for generations so it’s really hard to find a true recipe, for instance, for something like Tamarind Pork – every family will have their own twist to it. “Getting recipes out of some of these families, my God it’s like squeezing eggs! And if you’re lucky enough to get a recipe they’re not measured in proportions that we normally use like teaspoons or grams. The dishes served to Lunchmag are typical for Macau and are almost too good to be found in comparable European restaurants. The Tamarind Pork retains a tangy, salty Asian aftertaste that comes from the shrimp paste. The secret to this dish is to leave the pressed rice and the pork overnight. The slow-cooked lamb shank falls off the bone after being casseroled for more than two hours and sits on a bed of white beans cooked in rosemary. The dense texture of the olive oil adds a golden colour and a fruity flavour. In the years that Chef Raymond has been mining Macau for recipes, he says he’s uncovered his fair share of undiscovered gems. “One gem, that I would consider such, is a Christmas dessert,” he told Lunchmag, sotto voice as if imparting a trade secret and conveniently forgetting its name. “I don’t know if I should even bring this one up,” he laughs. “But it’s a real pain to make – you have to stir the sugar a lot. For paying guests, however, Raymond is sure to recover his memory. The restaurant trains students in its Culinary Arts Management course but, as Raymond points out, only professionals rather than students prepare and cook the food at the restaurant. The only downside is that, being an educational restaurant, it is not open on Friday evenings or the weekend. Be sure to book early for a weeknight table.